Accordion player and singer Séamus Begley is one of the most popular Irish traditional musicians, coming as he does from one of the most musically acclaimed Irish families. Seamus is the quintessential Irish musician, an eager storyteller known for his sharp wit and famous for pumping out tune after tune at all night sessions. He plays with an energy that is alarming, bringing a frisky spontaneity to his box-playing, belting out jigs, slides and polkas with rapid sprays of reckless ornamentation before making a sudden key change into a bitter-sweet air, sung or played on the accordion. His repertoire reflects his own place and his style of playing is much influenced by a now gone generation of accordion and fiddle players who came to céilí in his family home. Seamus’s style is unique and he is considered by many to be one of the finest players of the dance music of West Kerry and is never happier than when people are dancing to his music. Séamus divides his time between his small holding in the West Kerry Gaeltacht and travelling Ireland and the world playing music. 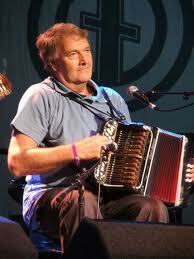 He has toured extensively with Jim Murray, Altan, Steve Cooney and Mary Black to name but a few.